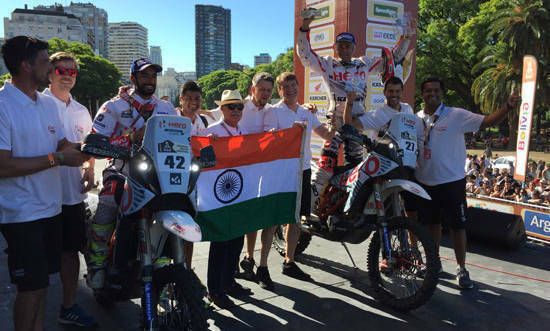 The 2017 Dakar Rally has come to an end, and Hero MotoSports Team Rally has come out with a rather impressive result in its first attempt at the rally. Joaquim Rodrigues managed to complete the comparatively short 64km competitive section of Stage 12 in 20th position with a time of 35m42s. This meant he completed the entire Dakar rally in 10th place in his first attempt. His team-mate CS Santosh, completed Stage 12 with a time of 40m39s to take 45th place, which moved him up one place in the overall standings to 47th. Both competitors seemed quite relieved to be able to make it to the finish line in one piece and were happy with their performances.